Do you keep text and image updates separate? 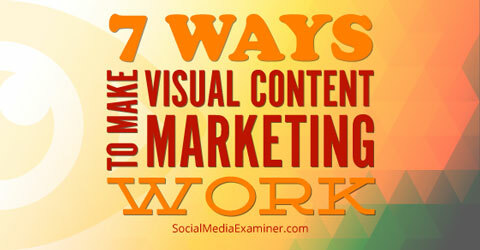 Have you considered how text and visual content complement each other? Pairing visual content with clever, descriptive text can create a true marketing force that leads to more interaction. In this article I’ll show you seven ways companies are using visual content to get better overall engagement. Find out how text and visual content engage your followers and fans. 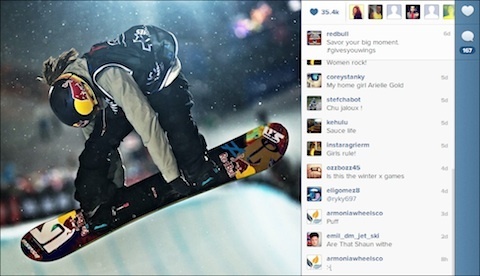 Most brands have text-based taglines, but how many are getting the most out of them? Every social media update you write is an opportunity to show, as well as tell, the meaning of your tagline. Red Bull’s tagline—Gives You Wings—is descriptive and gives you a pretty good idea of what they’re going for. But when the company uses photos to reinforce the written tagline, it becomes real and exciting. That excitement helps them maintain their market share lead. Red Bull’s brand tagline wouldn’t be the same without visual content. Simply Measured analyzed Red Bull’s social media updates and found that photos accounted for only 5% of their posts, but delivered 90% of their engagement on Twitter and Facebook. Infographics deliver up to 120-180% more engagement than text-only posts. The problem is that so many marketers are posting the same kinds of infographics (usually graph-heavy) that yours can easily be overlooked, especially if it’s a variation on the same theme. Intel launched an educational campaign using infographics to bring attention to and reduce online oversharing. Intel educates the public with relatable images and words to keep them safe. Notice how the Intel infographic uses photos from the consumer’s perspective? There’s not a graph to be seen. And the text overlays name information most people have considered sharing online (or have already shared). 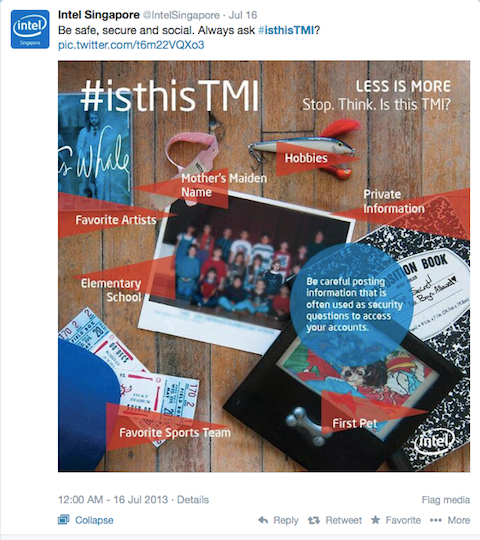 Rather than creating an infographic with cartoon icons, statistics or graphs, Intel used well-done pictures and concise text to communicate what consumers should and shouldn’t share online. Putting oversharing in the context of the reader’s point of view helps make the infographic personal and relatable. One problem in social media is getting lost behind a logo and a corporate “big business” image. Even if you’re in a more serious industry like tax preparation, accounting, banking or insurance, you can always add a human perspective to your business. A little humor creates big engagement. 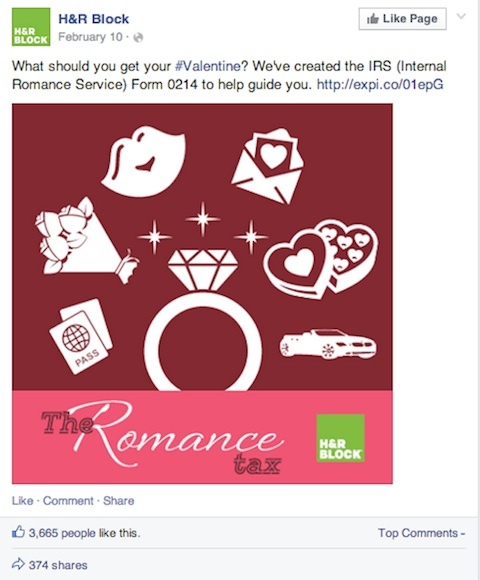 The tax preparation company uses their Facebook page to share a sense of humor with fun illustrations and jokes. With almost 380,000 fans on Facebook, H&R Block sees an average of over 500 engagements per post and nearly 30% of fans engaged. Not bad for a niche most people aren’t usually excited to talk about. Let’s be honest. At the end of the day, we marketers are using social media to sell something. Don’t underestimate the simple tactic of showing pictures and describing what you’re selling. A new outlet at the Riverwalk in New Orleans was the first of its kind, offering upscale local fashion and cuisine. The outlet decided to use Instagram to do a little show and tell. Combine pictures and descriptions for more interaction. 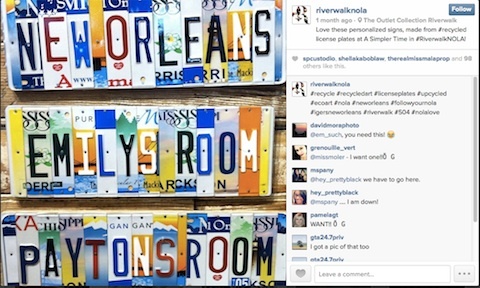 The Riverwalk New Orleans‘ Instagram account teemed with images and descriptions of distinctive items and food, and drew quick response—they doubled their number of followers and quickly increased their online presence. With so many virtual experiences available these days, some businesses face the challenge of even getting people in the door. 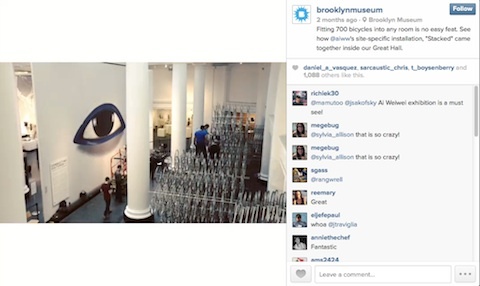 Brooklyn Museum experienced that problem and rose to the occasion by amassing an impressive social media presence on Facebook, Twitter, Tumblr, YouTube and Instagram. The museum features photos and videos that bring its collections to life and each account is written to include captions that provide context. The result is thousands of likes and shares. Pair photos and videos with text to get people excited. The combination of beautiful images, facts, background and additional information creates an enormous social response. The museum also uses geotagging to subtly encourage fans and followers to visit the museum in person. It’s no secret that consumer connections drive business and sales success. Think about what gets your customers excited about your product and come up with short phrases that convey that feeling. Pair the phrases with an image that reinforces both your product and your customers’ sentiment for a winning engagement combination. Green Mountain Coffee connects with their audience this way. Their consumers relate to sayings such as “Coffee helps me become the morning person I am not.” Additional meaning and connection are added to the phrase when it’s placed over a blank page and pen on a desk (suggesting that not much work gets done before having coffee). Fun photos with text overlay can get a big reaction. Their fans relate to needing a little help to get their day started, and after commenting on and liking the update, they want to share the sentiment with others. 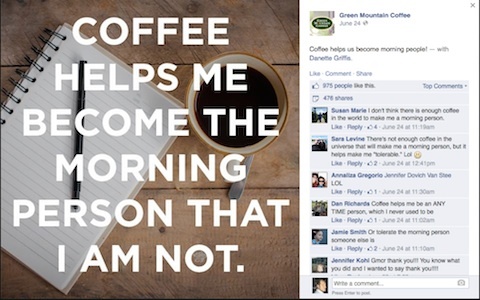 The response on most of Green Mountain Coffee’s insights and photos is hundreds and even a thousand likes and shares, and an impressive number of comments. What’s not to love about user-generated content? It’s an easy way to encourage more audience participation while pointing the spotlight at those fans—and it highlights your products being used by happy customers. REI launched their 1440 campaign to document their fans’ love of the outdoors. The campaign aimed to post a picture of fans enjoying the outdoors for every minute of one day (1,440 minutes). Consumers’ photos of their outdoor adventures becomes branded content for REI. The response to the project was enormous and the user-generated content created strong community, showcased brand evangelists and kept people coming back to see the progress of the campaign. Text and image updates don’t have to be mutually exclusive. Used together they’re a force to be reckoned with and may be the difference between a passing look and true engagement. What do you think? How do you integrate text with your visual content? Have you had more success with imagery alone or a text and image combination? Leave your comments below. A professor and researcher at Johns Hopkins University, Keith Quesenberry has nearly 20 years experience as an award winning advertising copywriter and creative director for Fortune 500 and startup clients.